Ready in just 5 minutes, this delicious recipe can also be made with flour or corn tortillas for a breakfast burrito, or with gluten-free English muffins. 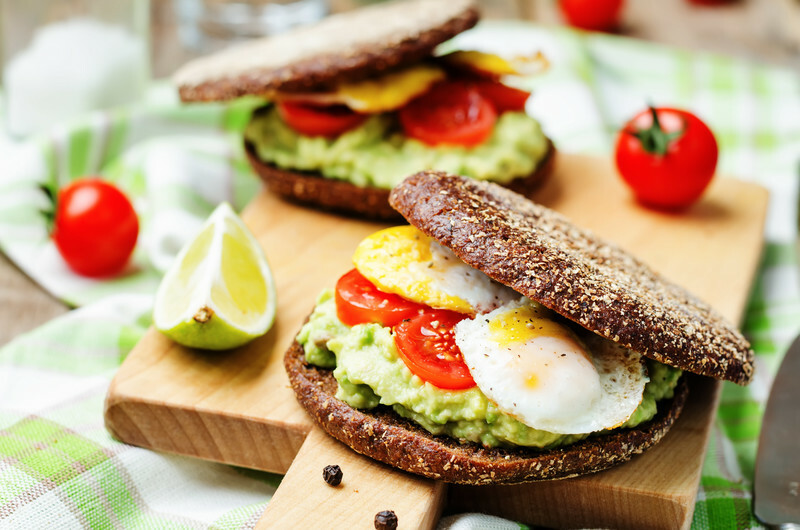 A recent analysis of studies linked eating one egg daily to a 12% drop in stroke risk and found no association with heart disease, while avocados help reduce cholesterol, inflammation and risk for heart attacks, other research suggests. Check the ingredients on the refried beans. Some brands contain lard, so products labeled “vegetarian” are the best bet to avoid excess calories and animal fat. Beans are rich in protein and heart-healthy fiber and may improve your cholesterol levels. It’s also important to include a side of fresh fruit, with this hearty sandwich, which we recommend as a “treat” option, rather than a daily meal, due to its high carb count. Serves four. Spread 1 1/2 tablespoon beans on the bottom half of each toasted English muffin. Layer with 1 1/2 tablespoon guacamole, a fried egg and 1/2 tablespoon of cilantro. Top with the other half of the English muffin. Serve with your favorite salsa and enjoy! Adapted from Busy Girl Healthy World. Nutritional information per serving (one sandwich): calories: 292; fat: 12 grams; carbs. 34g; protein: 14g; sodium: 547mg; sugar: 7g.